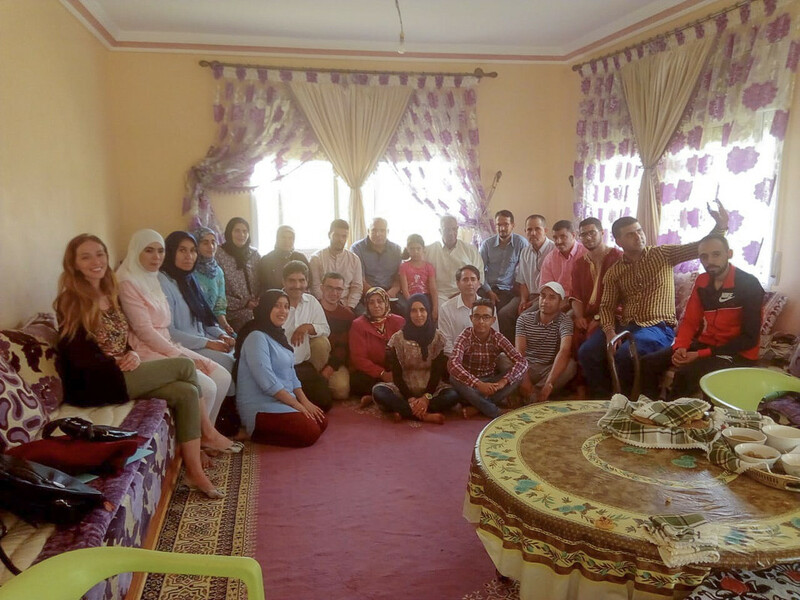 In a little under just one week, the High Atlas Foundation (HAF) has met with members of 21 cooperatives throughout four provinces of the Oujda Region in Morocco. We have learned the stories behind the development of their cooperatives, about their products, unique manufacturing techniques, the highs and the lows of establishment, ongoing challenges, and impressive achievements. These details, of course, differ across each cooperative, but one common sentiment was reiterated time and time again: members from provinces stretching across Oujda have all shared gratitude for the knowledge and skills they acquired through HAF’s cooperative-building training, made possible by the Middle East Partnership Initiative (MEPI). While we are overjoyed to hear the different ways in which our MEPI-funded training has significantly impacted the progress of cooperatives in Oujda, we recognize that is just the beginning of how we can help pave the way to success. We assist along many steps, such as helping cooperatives build relationships with their provincial authorities. On September 9th, HAF staff met in one large room with members of seven cooperatives of the Guercif province. It is perhaps no coincidence that facilitating a meeting utilizing the participatory approach—the very core of all of HAF’s sustainable development projects—proved to be extremely fruitful. One result of having a participatory meeting with multiple cooperatives was the revelation of the commonalities and shared needs among the large group, followed by equally beneficial solutions. For example, Haoud Jdi and Elmanousri are two women’s cooperatives, both established in 2017, that sell food products: olives and couscous, and cookies and couscous, respectively. Each cooperative expressed a need for a central location for production as it would not only be more able to acquire certification from the food inspectors and thus enable the product to reach national markets, but also increase the quantity of their products made daily. Seeing this shared need between two similar cooperatives, HAF President, Dr. Yossef Ben-Meir, suggested Haoud Jdi and Elmanousri join forces for shared benefit. The women agreed and identified a goal to submit a proposal to their local governmentto create a coalition, including an invitation to a third women’s cooperative, and identify with them available land and a building structure for their production activities. The participatory meeting also consequently highlighted the importance for cooperatives to consider how they can bridge their internal resources (i.e., skills) with their external ones (i.e., funding, land, etc.). For example, the TamzrayneCooperative, created in 2009, sells oil from different medicinal plants, mostly rosemary flowers. They have a partnership with Morocco’s High Commission of Waters and Forests, which has provided 3,000 hectares from where they can harvest the wild medicinal plants, and they also have members who skillfully sell their products. Again, seeing the cooperative’s strengths, Dr. Ben-Meir suggested Tamzraynemaximize the use of their resources and widen their cooperative’s production, based on the vision of the cooperative members. Specifically, since theyalready have land, water, and members skilled in selling plants and plant products, it would be feasible to establish fruit tree nurseries and cultivation (carob and nuts), thereby giving them the opportunity to make more profit from additional products. Further, the meeting exposed to cooperative members the significance of considering what resources they already have or that they can access on their own. Several cooperatives reported utilizing the ministries and other agencies to submit project proposals for potential partnership-building and financial support. The Hikma Agriculture Cooperative, for example, submitted a proposal to the Ministry of Agriculture to fund land, water well construction, supplies, and a building for production. On the other hand, the men’s bread-baking cooperative, Chebab Hamria, used their existing network to secure a production site rent-free for six months. Over the course of HAF’s Oujda trip thus far, it has been made clear that trainings such as our MEPI-funded cooperative-building training is vital for giving members the tools, resources, and confidence to pursue their goals. Attending the workshop gave participants knowledge about how to establish their cooperatives as well as helped them acquire or build upon skills necessary for managing successful businesses. However, it has also been made clear that beyond knowledge and skills-building training, cooperative members need guidance on how to utilize not only already-existing resources but also how to team-up and utilize each other for shared benefit. The participatory planning meeting in Guercif proved to be a crucial tool that cooperatives can use to identify common needs and share experiences. Moving forward, HAF will urge members of different cooperatives within one municipality or province to develop a supportive network through the participatory approach as we continue our efforts to help cooperatives throughout Morocco excel.